Sreedhur Moonshee's Ghat and Rana Muhul, Benares. bl.uk > Online Gallery Home	> Online exhibitions	> Asia, Pacific and Africa Collections	> Sreedhur Moonshee's Ghat and Rana Muhul, Benares. 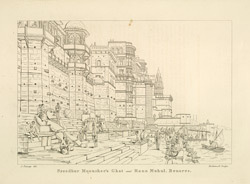 Plate 11from the second part of James Prinsep's 'Benares Illustrated'. Prinsep (1799-1840), an antiquary and colonial administrator was assay master at the Benares Mint between 1820-30. The lithographs published in this collection were based on his original sketches of the various views of the 'holy' city of the Hindus. Of this view he writes: 'Shreedhur, formerly one of the ministers of the Raja of Nagpoor retired from office in the year 1812, and obtained permission to reside at Benares. He built a magnificent edifice of stone to the south of Kewulgir ghat, of which the present engraving gives but an imperfect idea. The Moonshee died in 1824, leaving as his heir, an adopted child of the name of Narayan Rao. The Rana Mahal or Prince's buildings, as it may be rendered in English, was erected by the Rana of Oodypoor, in the 17th c. for the accommodation of travellers and pilgrims...The women seated in a row on the margin of the water are engaged in making little clay images of the lingum, which they place beside them, sprinkle with water, milk, flowers etc...'.